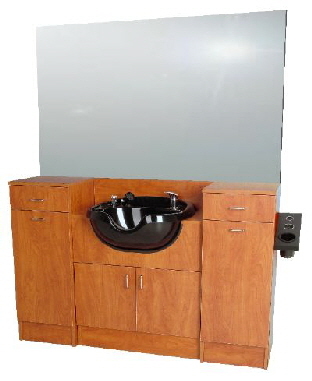 Java Barber Station w/ BUILT-IN Shampoo Bowl. Customer must choose 8900 Oval Bowl, as pictured, or 8300 Traditional Bowl. Includes 570 fixtures; 388 vacuum breaker separately. Doors below the bowl for plumbing access and storage. Includes two full-extension drawers, two storage areas w/ shelves, convenient side-mounted tool panel with holders for a blow dryer and two sets of clippers. Electricity by customer. Wall-mounted 36" x 60" mirror is ordered separately. Choose a Standard Color: Black, White, Fusion Maple, Wild Cherry, or Cocoa Maple.